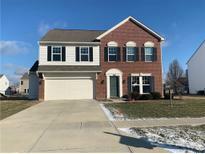 Below you can view all the homes for sale in the Trails At Woodfield subdivision located in Greenwood Indiana. Listings in Trails At Woodfield are updated daily from data we receive from the Indianapolis multiple listing service. To learn more about any of these homes or to receive custom notifications when a new property is listed for sale in Trails At Woodfield, give us a call at 317-987-2530. The Trails at Woodfield is a great neighborhood with community pool, play ground and sidewalks to get out and move around. MLS#21631365. Indiana Realty Pros, Inc..
Adorable front porch too! This one wont last long! MLS#21630080. CENTURY 21 Scheetz. Additional Features: 3 Car Garage, Covered Front Porch, Community Park, B-Ball Court & Pool. Won't Last! MLS#21622130. CENTURY 21 Scheetz. You will love the open layout and 20 windows throughout the house making this a very bright home. Definitely worth a look! MLS#21618464. Market Street Realty LLC.